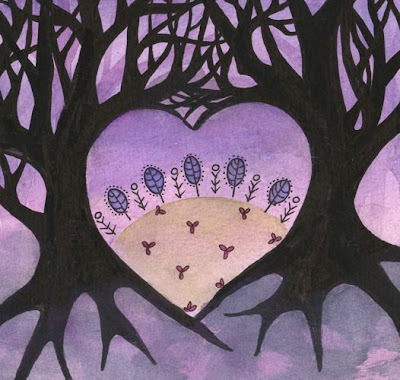 Found Art Friday -- BIG LOVE! Welcome to the revival of FOUND ART FRIDAY: A monthly collection of themed art from blogs, artists and creative people around the world. This month's theme is BIG LOVE, and I am absolutely thrilled that we've had so many contributions! The concept of Found Art Fridays is to create a piece without much planning, allowing yourself to give in to the fun and spontaneity of the creative process. I think the artists here did a tremendous job! Beneath each piece, I've listed the artist's name and a link to their blog or website so that you can learn more about their work. Enjoy!!! Heather Kirtland 8x8 encaustic on cradled birch. 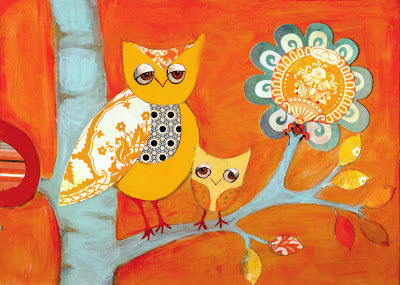 "All You Need is Love" by Emma Talbot of Little Brown Rabbit. 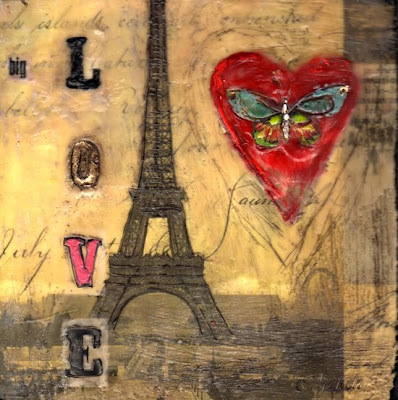 Mixed Media Love Collage by Tara Leaver of Aquamarineart. 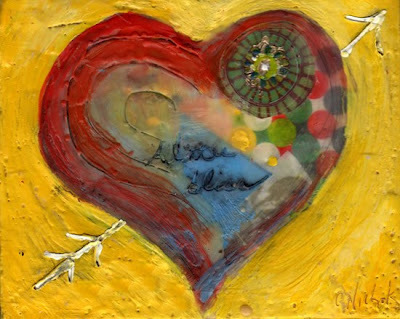 "A Little Bliss" -- freeform encaustic heart by me, Cathy! 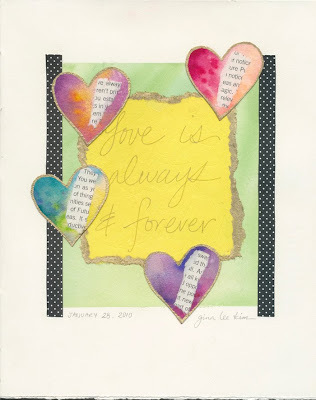 "Love is Always and Forever" by Gina Lee Kim. 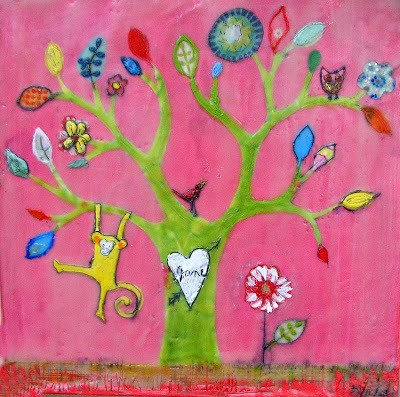 "Love Smiles" by Michele Gallagher of Artistique Muse. Thank you to all of the artists who participated in Found Art Friday this month, and I hope you will join us again for next month's theme EVERYTHING BLOOMING: on 2/26. "Sweet Baby Jane" commissioned encaustic painting for a lovely mommy-to-be -- Jennifer!! This is my latest wax creation for a little baby girl soon to be born. Her nursery is pink and green with a "secret garden" theme, so I included lots of flowers in the tree and little animals to keep her company. There's an owl, a little bird and, of course, this jolly yellow monkey swinging from a lower branch. There are also touches of gold leaf in the flowers. Every night before putting my son, Nicky, to sleep, he waves goodbye to the animals in one of his paintings. It makes me smile to think that Jane may do the same one day! I can't believe January is almost over -- but it is, and FOUND ART FRIDAY is coming up at the end of the week (1/29). 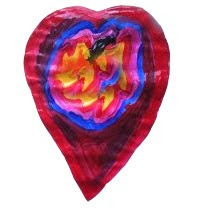 The theme is "Big Love," and you are welcome to submit your experiment in painting, photography, performance art or any other medium -- as long as it revolves around Big Love -- for my post this Friday. In case you are new to my blog, Found Art Friday is a round-up of artwork that I post every last Friday of the month. The theme varies, but anyone can contribute. The idea behind "Found Art" is that it's something done freely without much constraint in a way that allows for serendipity and surprise. So, if you feel like contributing, just be creative and have fun. Then post the artwork on your blog & send me a link (and I will repost) OR just email me a jpeg image (if you are blogless). My email is cnichols19@aim.com. Happy BIG LOVE!!! Can't wait until Friday! Thank You For Helping Haiti! I am SO happy to announce that Paintings By Cathy Nichols was able to raise $53 for Haiti last week by donating 10% of sales to the American Red Cross's relief fund!!!! I just made the donation this morning, and it warms my heart that we were able to do our small part to help. Thank you to everyone who supported Haiti this week through my fundraiser and in all other ways. Together I know we are making a difference. Wishing you a happy Sunday! 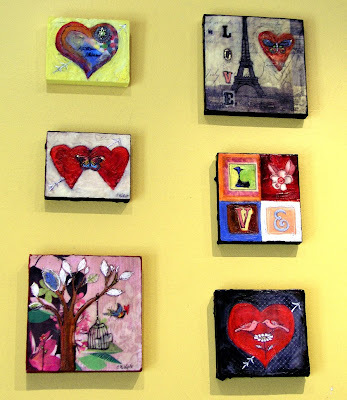 A New Grouping of My Paintings at the lovely Caffe Portofino in Northport. Originals are all SOLD. Prints are available here. After 3 weeks of waiting, my new shipment of encaustic medium finally arrived yesterday, and I was able to complete all of the paintings I had been designing this month for Valentine's Day. And today I enjoyed a delicious mocha and hung them up at Caffe Portofino. I just love showing my work at this coffee shop (though my coffee addiction is cutting a teensy bit too much into my profit margin)! The paintings are also for sale at my Etsy shop (almost all of them are posted -- I still need to put up the bottom right piece (Kiss Me) and the top left (A Little Bliss). 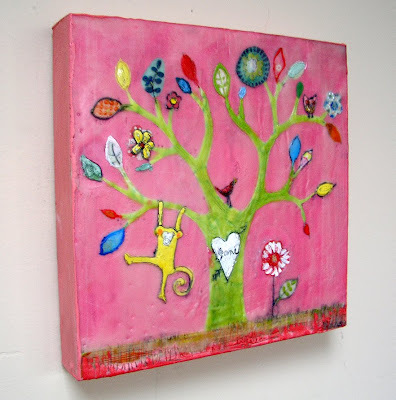 "Little Darling" -- Acrylic and cut paper on wood panel. This is a painting that I recently completed for a lovely woman. There is a very special story behind this particular painting, but I dare not share it without her consent. But I love the colors. Before shipping it off, I propped the original up in my yellow and white dining room, and it positively popped off the wall. I love this painting. And the title makes me happy. It's a portrait of a mother and baby owl (like another I have done in the past), and I was searching for the perfect title. I thought the piece looked sunny. Then I thought of the Beatles song "Here Comes the Sun," and immediately I got chills. This was precisely the same song I sang to Annabelle as a lullaby when she was a tiny baby (it actually put her to sleep despite the lyrics!). So this painting is called "Little Darling." I hope it brings joy and luck to its recipient. 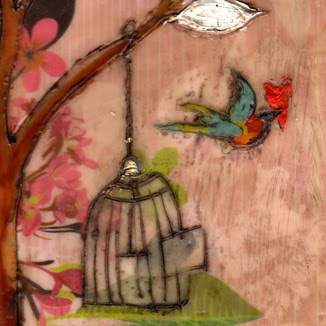 "Love Sets You Free" detail of original encaustic painting. For sale here. Back by Popular Demand... Found Art Fridays!! 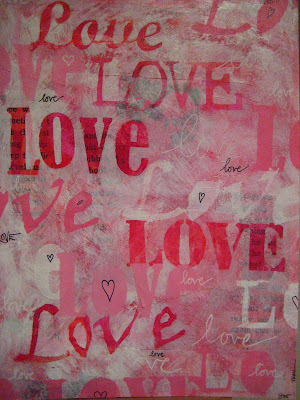 "Big Love" new Original Encaustic Painting -- available here for sale. It has been many months since the fun days of "Found Art Fridays" here on the blog, and I must say that I miss the little community we were building together by sharing our artwork. I had originally intended to start another blog for this purpose, but the idea proved a tiny bit too daunting for my present time contraints. Yet now that little Nicky has started playschool 3 mornings a week, I do have a tiny bit of extra time. And I would love to start up Found Art Fridays again!! But this time, I am going to do things on a monthly rather than weekly basis. So, until further notice, the last Friday of the month will be Found Art Friday here on my blog. For those of you who are new to the concept, the idea of Found Art Friday is that you (and I) create a piece of art based around a specific theme. 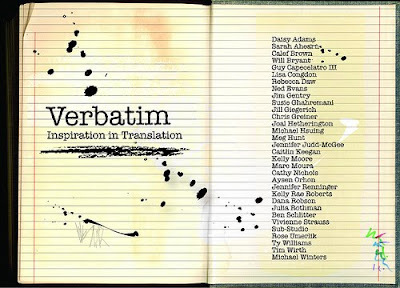 Then I will share all of our work on the blog (with links back to your blog). All you need to do to participate is email me at cnichols19@aim.com to let me know that you have a Found Art piece. Then you can either blog about it, and I will swipe the picture from your post, or -- if you don't have a blog -- you can email me a jpeg of your image, and I will post it. Here are some more samples. I'll give more instructions and information on the Found Art Friday concept as our deadline approaches. 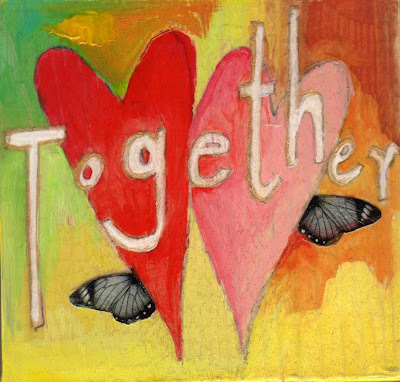 It is Friday, January 29, and the theme is -- in honor of Valentine's Day -- BIG LOVE! But, please get me your link or jpeg by Thursday, January 28th. I am so excited, and I hope that you will be able to participate! "A Light Around Her." Print available here. I am sitting here on this snowy New York day watching the flakes gently drift down from the sky... and I am feeling such a surge of gratitude to so many people. To my mom right now for kindly taking my daughter on a walk so that I can relax. And to my friend, Ellen, because she made me laugh all night last night. To my husband for taking the children to school this morning. To the Nahcotta Gallery for selling my MADLY painting even before opening night (how did you guys do that?!). And VERY much to all of you who are reading this blog today. I appreciate you all so much for caring about the stories I spin with paint and imagination and for kindly logging in to share your thoughts. So THANK YOU! And, oh my goodness, another special thank you to ANNABELLE today because it is her birthday. She is 3! Thank you, Annabelle, for being such a brilliant, fiesty yet gentle soul. I love you. 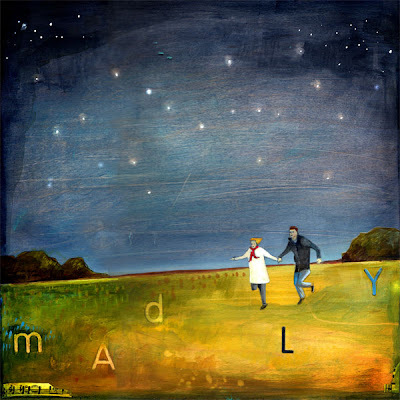 My piece for the Verbatim show: MADLY. Prints on sale here at Etsy. I just have to share this video of Melissa Moss's son, Sam, playing the drums. He is 2 and 1/2. I truly think he is amazing, not to mention totally adorable. Enjoy!